Premium Staple Fish Food - Aquascape, Inc. If you want happy and healthy pond fish, you need to be feeding a high-quality fish food. 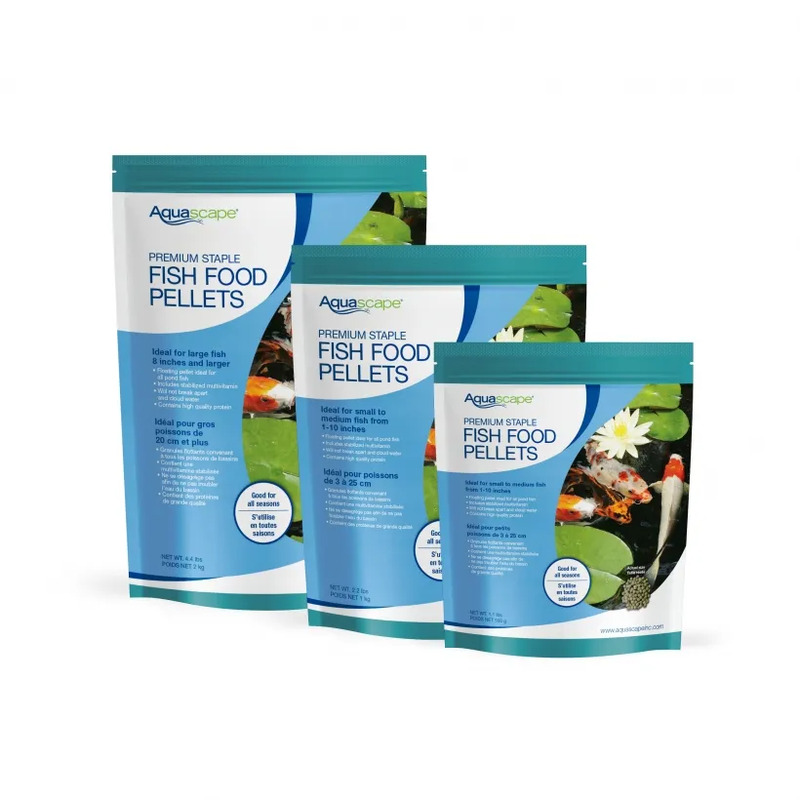 Aquascape Premium Staple Fish Food Pellets are formulated for everyday use and provide your pond fish with the nutrition they need to thrive at an affordable price. All Aquascape fish foods contain probiotics that aid in digestion and reduce fish waste, while the high-quality protein included helps to optimize growth rates. The floating pellets contain stabilized vitamin C and other quality ingredients and are scientifically formulated for all pond fish, including koi and goldfish. Aquascape fish food will not break apart during feeding, helping to maintain clear water conditions. Aquascape is passionate about the products we produce, providing unique products, designs, and features that stand above the competition. Why: Regularly feeding your fish a well-balanced food will help to keep your fish healthy, happy and colorful. Aquascape fish foods contain beneficial microbes that aid in digestion, enabling fish to assimilate nutrients resulting in less waste, better nutrition and a cleaner pond. or 15° C before feeding this formulation. Lower temperature formulations are available. Keep out of reach of children. DO NOT STORE OUTSIDE. Store at room temperature. Fish meal, wheat flour, shrimp meal, salt, chitosan, fish oil (preserved with ethoxyquin), lecithin, brewers dried yeast, calcium carbonate, iron proteinate, vitamin E supplement, dried Bacillus subtilis fermentation extract, choline chloride, inositol, L-ascorbyl-2-polyphosphate (vitamin C), manganese proteinate, zinc proteinate, biotin, niacin, calcium pantothenate, vitamin A acetate, copper proteinate, vitamin D3 supplement, riboflavin, pyridoxine hydrochloride, thiamine mononitrate, beta carotene for color, calcium iodate, sodium selenite.